Right, a quick recap before we get started. 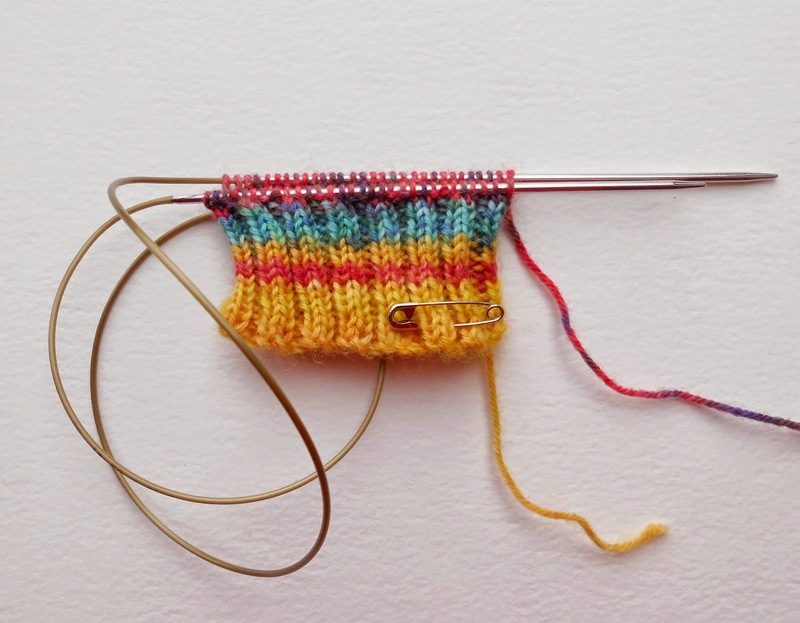 If you need to remind yourself of any of the preparations we’ve talked about up until now – yarn, needles, tension squares, accessories, matching self-striping yarn and the anatomy of a sock, then you can find all of the posts here. You’ll also need a copy of the pattern we’re going to use – my basic 4ply sock pattern – which you can find here, so that you can follow along. Now, I’m going to show you how to make these socks with each of the sets of needles that I’ve talked about the earlier blogs posts – short circular, DPNs and long circular – but you only need to pick one set to work with. There’s going to be a lot to get through and LOTS of pictures so I’ll keep it all as simple as I can. It will be easiest to see what I’m doing if I keep all of the information for each type of needle together, so scroll through until you find your preferred one. I’ll be giving you exactly the same information for each type of needle so don’t worry that you’re missing something if you’re using one and not another. Got everything? Great! 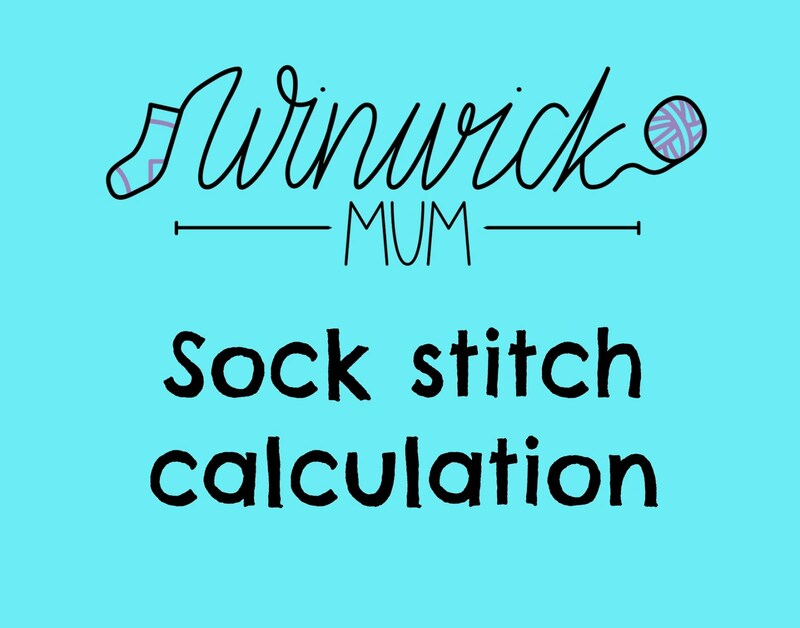 Here we go … drum roll please ... Week 1 of the Winwick Mum Sockalong! I’ve based this sock pattern on 60 stitches. 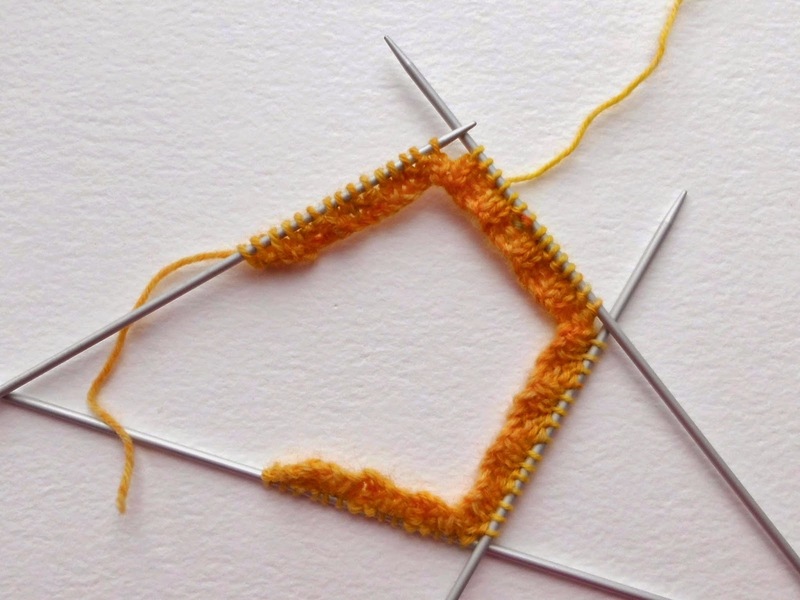 Because I know you will have completed your tension square and worked out the right gauge for your sock, you will know if 60 stitches is the right number for you, or whether you need to add more stitches or take some away. If you need a bigger sock, simply add stitches in blocks of 4, so cast on 64, 68, 72 stitches etc, and if you need a smaller sock, remove stitches in blocks of 4 so cast on 56, 52, 48 etc. Cast on 60 stitches using 3.0mm DPNs. This is optional; you can use 2.5mm needles but I find that using a larger needle size gives me a slightly looser cable edge, which in turn makes it easier to put your socks on. I use the cable cast-on method which I showed you in the tension squares post, but you can use any method as long as it’s a nice stretchy cast-on. The reason that I use DPNs to cast on before changing to my short circular is that I find it much easier to transfer the knitting to the circular after I’ve completed the first two rows – there’s more knitting to get hold of and the stitches are less likely to twist. Now we are going to change to our 2.5mm circular needle. All you have to do is to knit the stitches from the DPN onto your circular needle for the next round, continuing to knit in k2, p2 rib. 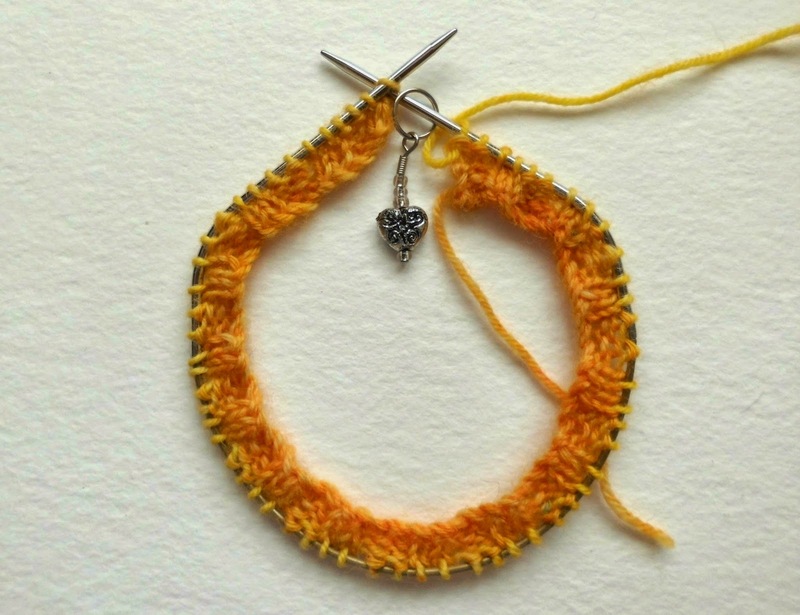 When you get to the end of the stitches, place a stitch marker over the end of the circular needle you are holding in your right hand, and then start the next round. Take care not to twist the knitting as you make the join, although you should be less likely to do that as you’ve knitted the two rows of rib first. You will be able to sew up the small gap where you knitted the first two rows on the DPNs later with your tail end. Continue in K2, P2 rib for 14 more rounds or until desired length of rib. (I knit 16 rounds of rib.) 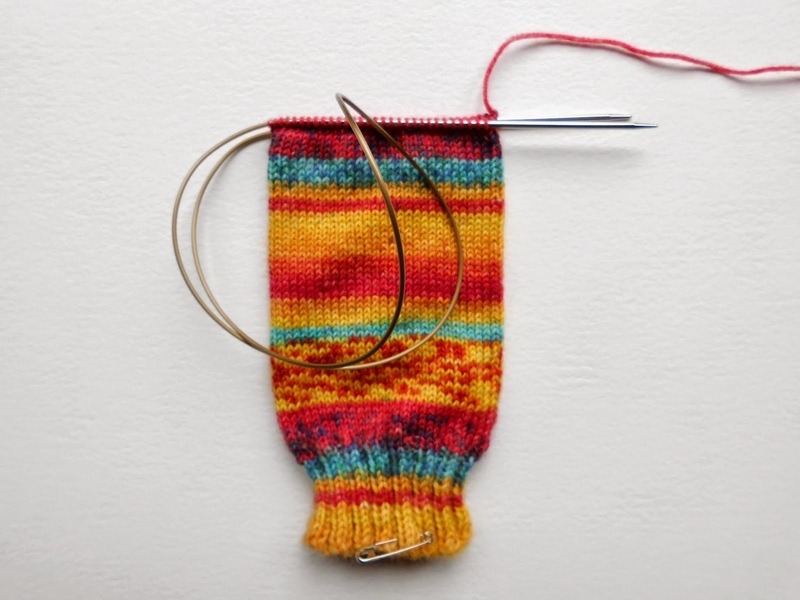 It might feel as if the stitches are pulling tightly on your needle as you knit and that your sock is rather an awkward shape, but this will rectify itself as you get further down the sock leg. I find that K2, P2 rib makes a nice solid rib which will hold your sock up. If you want to experiment with K3, P1 rib or even K1, P1 rib then feel free to do so. What I wouldn’t recommend is skipping the rib altogether unless you really can’t bear tight things around your ankles and even then a few rows are a good idea – your socks will fall down if you don’t have any rib at all! Everything OK so far? It’s onto the leg part now and this is very easy – all you’re going to do is knit each round, remembering to slip the marker across from one needle to the other when you reach it. If you haven’t done so already, it’s a good idea at this point to start keeping count of how many rows you are knitting so that you can make sure that your second sock matches. Once you get to the leg, you’ll see why socks are such great projects to travel with – they occupy your hands and mind but not a great deal of space! 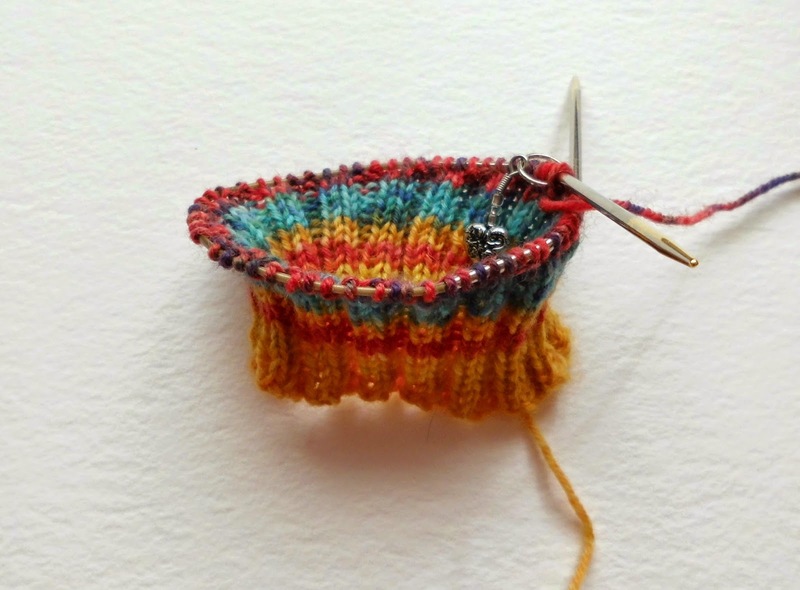 To create the leg part of your sock, you simply knit each round. 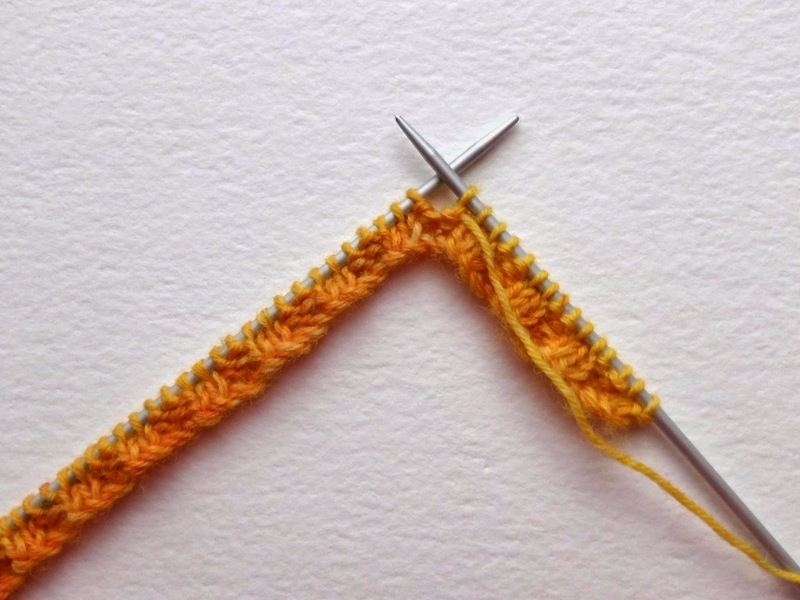 If you haven’t done so already, it’s a good idea at this point to start keeping count of how many rows you are knitting so that you can make sure that your second sock matches. Continue to knit each round until you reach your desired length before the start of the heel (for me, this is 75 rounds in total including the rib). The heel flap I create is 2” long so you can measure from the base of your foot if you’re not sure how long to make your leg section. You can always make your heel flap longer if you want to (you may want to do this if you have a high instep as it will the sock easier to put on). This is a very flexible sock! 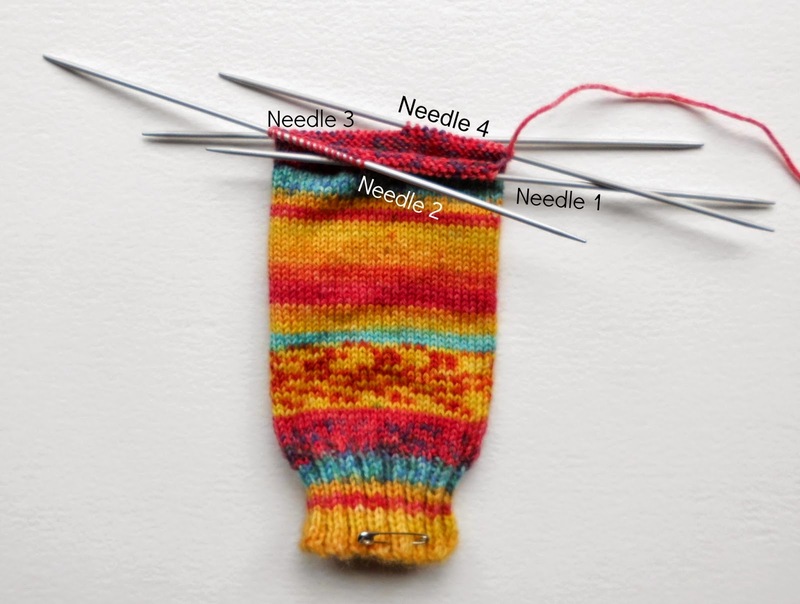 If you want to try your sock on at any point you can do so, but be careful that you don’t slide any stitches off the needle. 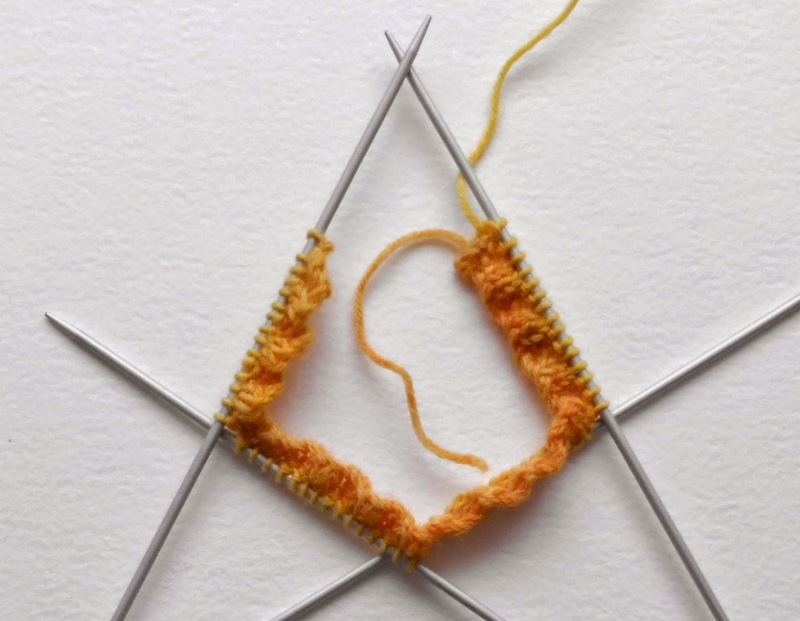 You can slip your knitting onto a spare piece of yarn or use stitches holders if you need to. That's this week's part finished. Easy, eh? J You're done for this week now, so jump down to the end of the page where I'll be telling you what we're going to be doing next. Before we start – all of the pictures in this post are based on using five DPNs. If you only have four, DO NOT PANIC, your sock will still work out just fine. 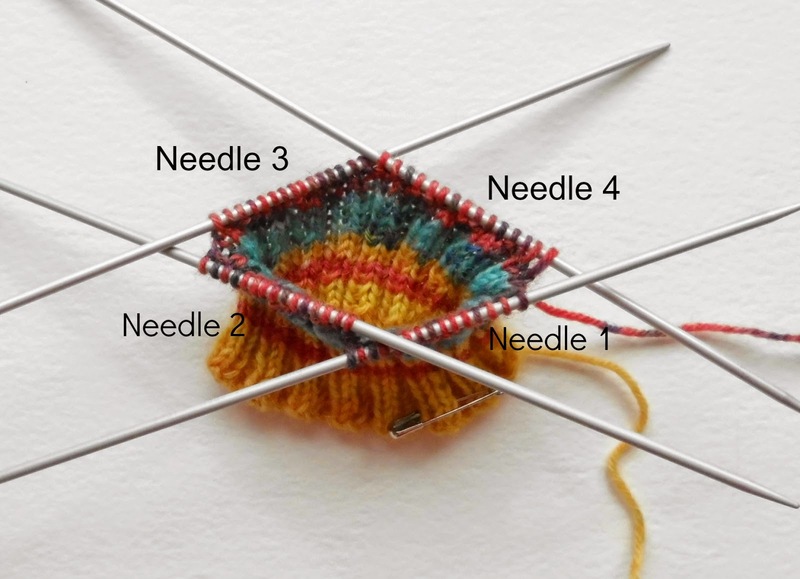 Instead of spreading your stitches across four needles and using one to knit with, you’re going to spread them across three needles and use the fourth to knit with. I’ll tell you how to do this when we get to this point. 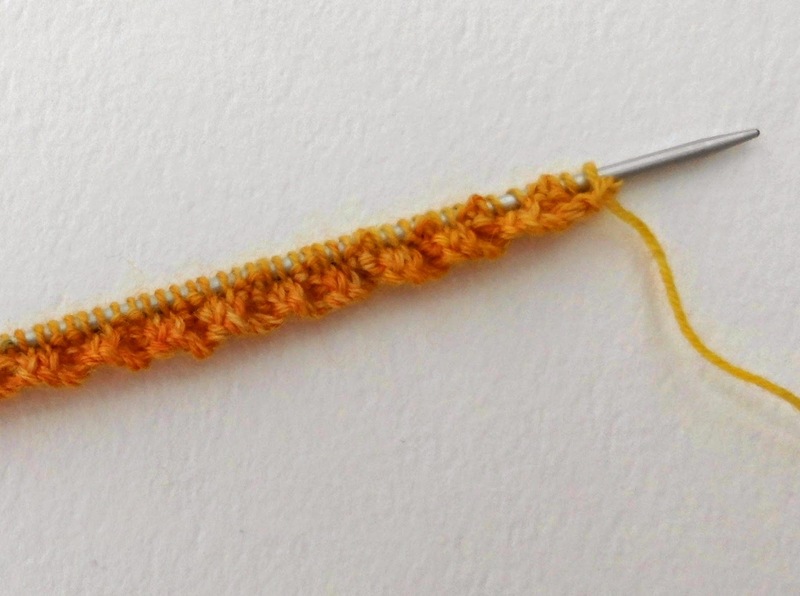 I always cast on with just two needles rather than trying to cast on across four needles straight away – I find it just too fiddly. Now we are going to bring in the rest of the DPNs, but at this point you’re going to change down to 2.5mm needles for the rest of the rib. Because you have knitted the first two rows, you’ll find it much easier to incorporate more needles without twisting your stitches, although care still needs to be taken. This is the point where it really might feel as if you’re wrestling with a hedgehog, but take it slowly and it will be fine! My preference is to knit on five DPNs and this is what I’m going to show you here. If you want to use four, that’s absolutely fine. Your sock will still work out just as well. All you need to do is divide the 60 stitches by 4, which will give you 15 stitches for each needle. However, that will mean you splitting your K2 or P2 rib stitches across the needles so you’ll find that it’s easiest to have an even number of stitches on each needle so we're going to split them 16, 14, 14, 16. It doesn’t matter that you have one more or less on each needle as long as your total number of stitches stays the same. If you have cast on more or less than 60 stitches, just divide the total number by 4 and that will give you the number of stitches for each needle, but again make sure that you have an even number on each needle. If you’re knitting on four DPNs, then just divide the total number of stitches by three. 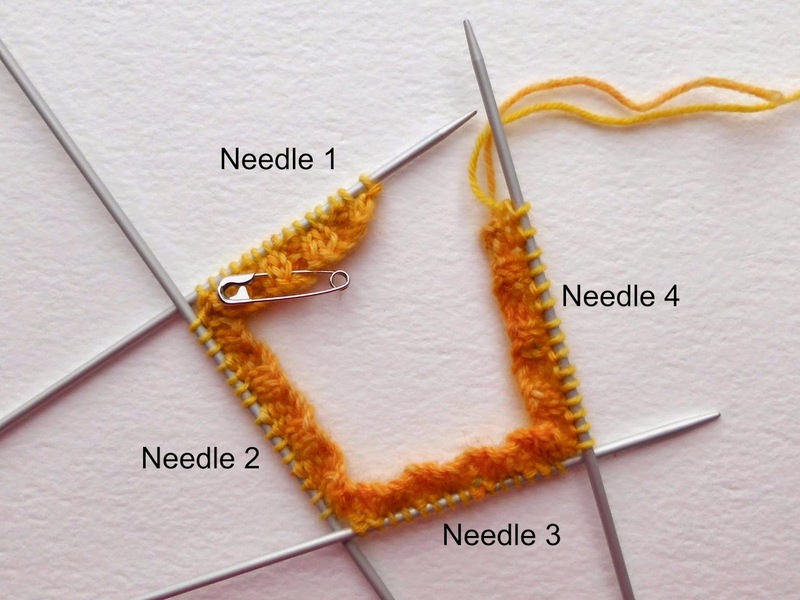 You’ll split them across your needles in exactly the same way as in the following pictures but won’t use the fourth needle as you’ll need that to knit with. Assuming that you’re working with 60 stitches, knit the first 16 stitches onto your first needle, continuing in K2 P2 rib. 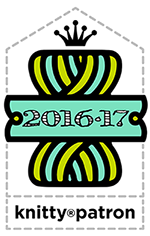 Now knit the next 14 stitches onto your second needle. This can feel very fiddly if you’ve not done it before, but it will get easier as you join your knitting into the round. It doesn’t matter whether you needles are on top of each other or underneath – and they’ll probably swing about a bit as well whilst you’re adding new needles. Just take it slowly. It’s not really necessary to use a stitch marker to indicate the end of your round when using DPNs, although I find it useful to mark needle one. I use a safety pin, which I pin into the knitting on needle one - although more attractive markers are available! 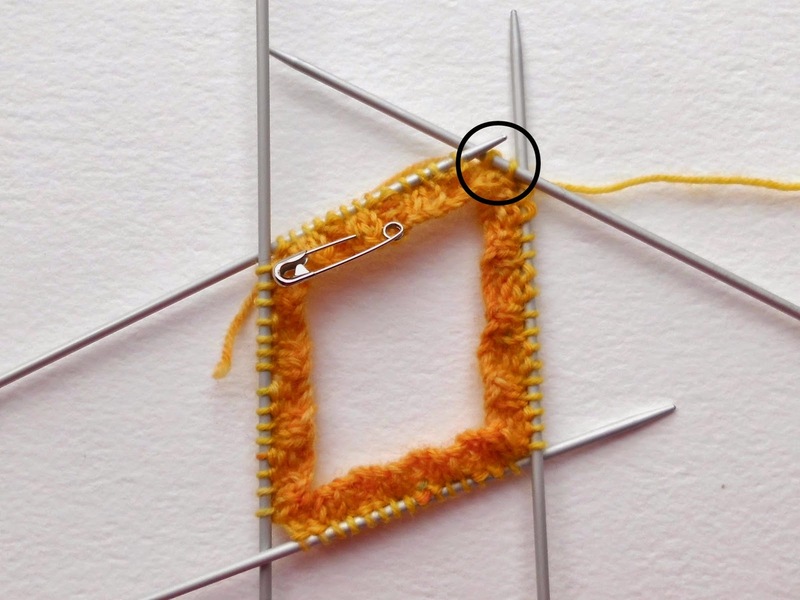 To join into the round, simply knit the first stitch of needle one onto needle five, pulling the yarn tightly for the first two stitches (circled in the picture). This helps to reduce ladders and should be done every time you change needles. You will be able to sew up the small gap where you knitted the first two rows on the DPNs later with your tail end. Everything OK so far? It’s onto the leg part now and this is very easy – all you’re going to do is knit each round, remembering to keep the yarn tight at the needle changes to stop ladders. If you haven’t done so already, it’s a good idea at this point to start keeping count of how many rows you are knitting so that you can make sure that your second sock matches. Once you get to the leg, you’ll see why socks are such great projects to travel with – they occupy your hands and mind but not a great deal of space! Continue to knit each round until you reach your desired length before the start of the heel (for me, this is 75 rounds in total including the rib). The heel flap I create is 2” long so you can measure from the base of your foot if you’re not sure how long to make your leg section. You can always make your heel flap longer if you want to (you may want to do this if you have a high instep as it will make the sock easier to put on). This is a very flexible sock! If you want to try your sock on at any point you can do so, but be careful that you don’t slide any stitches off the needle. 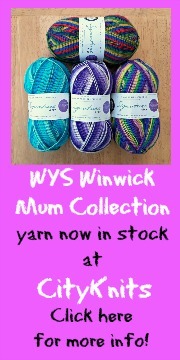 You can slip your knitting onto a spare piece of yarn or use stitches holders if you need to. Cast on 60 stitches using 3.0mm DPNs or your circular needle. 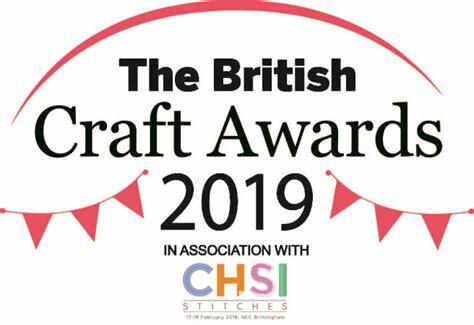 The needle that you use to cast on is entirely your choice - it really doesn’t matter whether you use DPNs or your circular needle for the cast on and first two rows as you’re not going to join your knitting into the round straight away. You can use 2.5mm needles but I find that using a larger needle size gives me a slightly looser cable edge, which in turn makes it easier to put your socks on. I use the cable cast-on method which I showed you in the tension squares post, but you can use any method as long as it’s a nice stretchy cast-on. If you chose to cast on with DPNs, this is the point where you are going to change to your 2.5mm circular needle - all you have to do is to knit the stitches from the DPN onto your circular needle. If you’ve cast on with your circular, just work across your needle as before but follow the instructions below for creating the magic loop, continuing to knit in K2 P2 rib. When you are ready to start the next round, pull the back needle towards you, lengthening the amount of cable you have to knit with in your right hand and shortening the loop on the left hand side (but don’t let it disappear altogether) and then knit into the front stitches, leaving another loop. Take care not to twist your stitches and remember to pull the yarn tight for the first two stitches you knit to avoid a ladder. You’ll see that you’ve created a sort of figure of eight with your needle. You will be able to sew up the small gap where you knitted the first two rows before joining into the round later with your tail end. 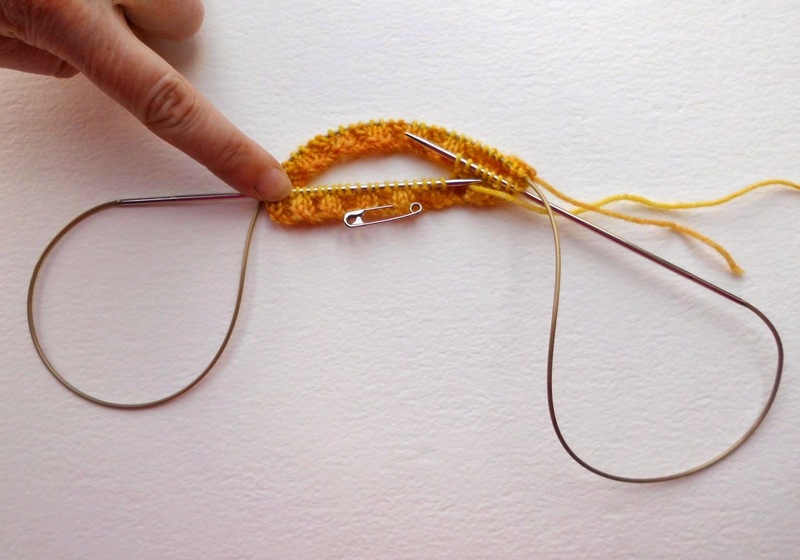 If you want to use a stitch marker, then when you get to the end of the stitches, place it over the end of the circular needle you are holding in your right hand, and then start the next round. If you use a stitch marker, you’ll need to knit the first stitch on the next needle onto your right hand needle to stop the stitch marker sliding off. 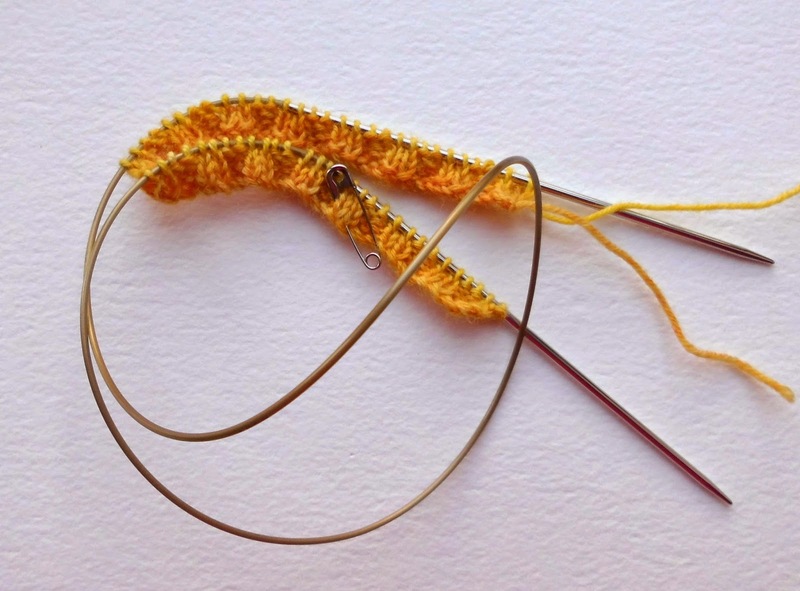 If you don’t want to use a stitch marker, you will still need some way of identifying the beginning and end of your knitting. You can see in the above picture that I’ve placed a safety pin in the “front” section of my sock so that if I get distracted in the middle of a round, I always know where I’m up to. Take care not to twist the knitting as you make the join, although by knitting two rows before transferring to your circular needle, it’s much easier to see that the stitches don’t twist. Continue knitting in K2, P2 rib for 14 more rounds or until desired length of rib (I knit 16 rounds of rib). I find that K2, P2 rib makes a nice solid rib which will hold your sock up. If you want to experiment with K3, P1 rib or even K1, P1 rib then feel free to do so. What I wouldn’t recommend is skipping the rib altogether unless you really can’t bear tight things around your ankles and even then a few rows are a good idea – your socks will fall down if you don’t have any rib at all! Everything OK so far? 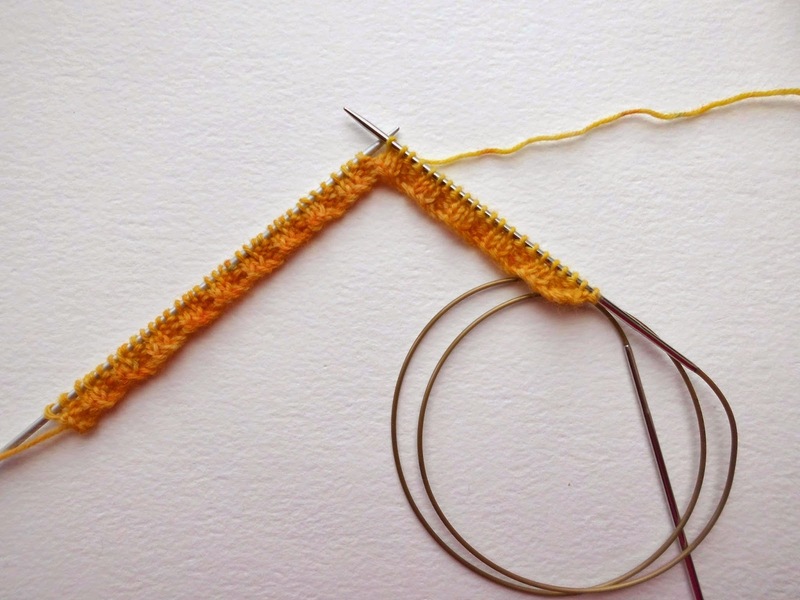 It’s onto the leg part now and this is very easy – all you’re going to do is knit each round. 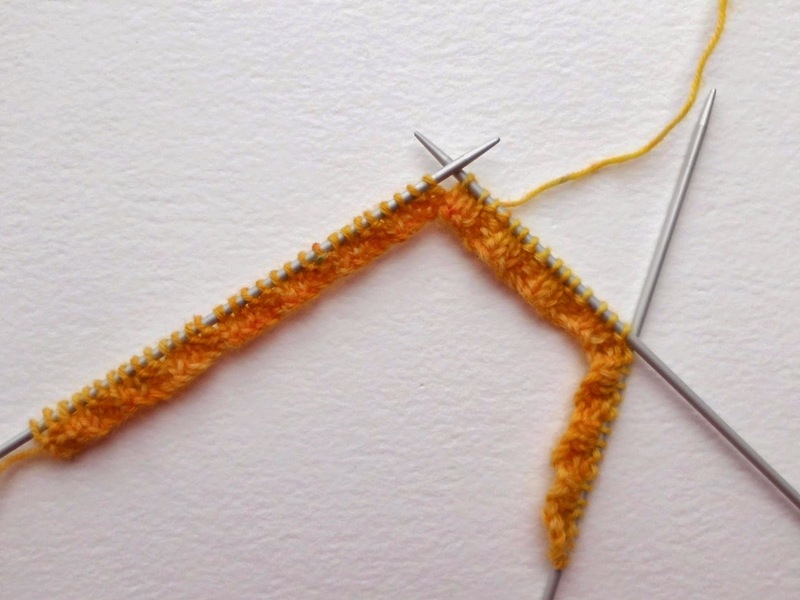 If you haven’t done so already, it’s a good idea at this point to start keeping count of how many rows you are knitting so that you can make sure that your second sock matches. Once you get to the leg, you’ll see why socks are such great projects to travel with – they occupy your hands and mind but not a great deal of space! 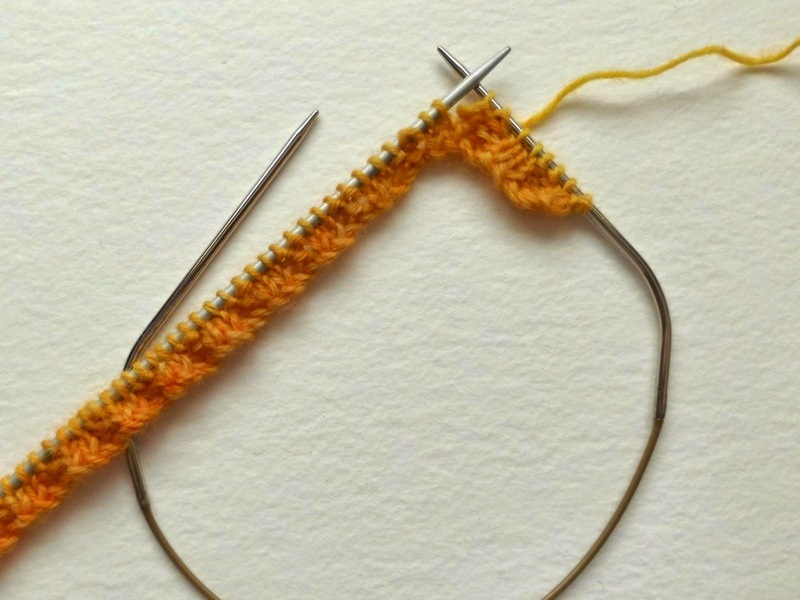 To create the leg part of your sock, you simply knit each round, remembering to slip the marker across from one needle to the other when you reach it if you’re using one. 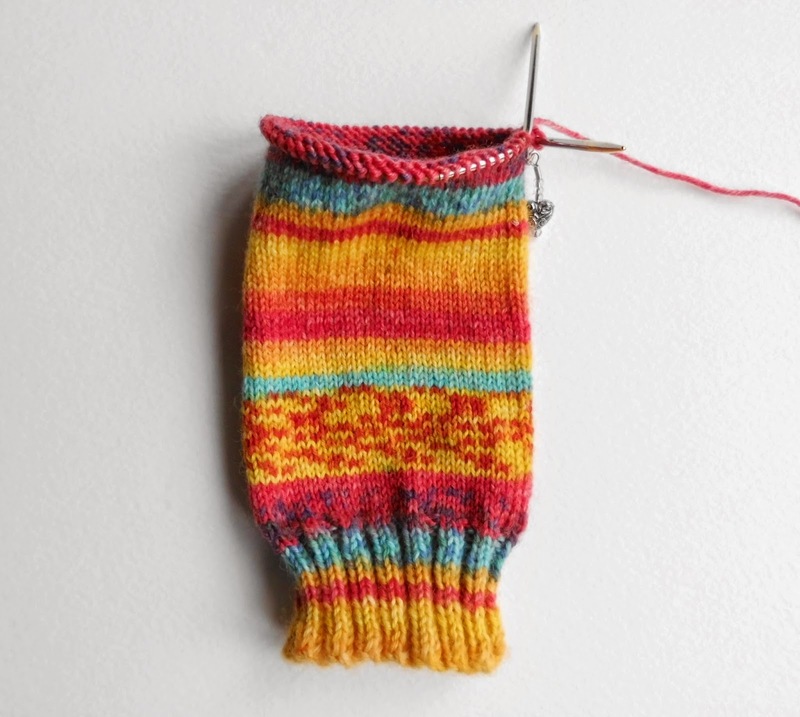 If you haven’t done so already, it’s a good idea at this point to start keeping count of how many rows you are knitting so that you can make sure that your second sock matches. Continue to knit each round until you reach your desired length before the start of the heel (for me, this is 75 rounds in total including the rib). The heel flap I create is 2” long so you can measure from the base of your foot if you’re not sure how long to make your leg section. You can always make your heel flap longer if you want to (you may want to do this if you have a high instep as it will make the sock easier to put on). This is a very flexible sock! If you want to try your sock on at any point you can do so - it’s much easier to do with a large circular needle than the other needles as the cable safely hold all the stitches. Phew! Everyone still with me? Don’t worry about the length of time it might take you – there’s no rush. The posts will always be available on the blog and you can find them here. 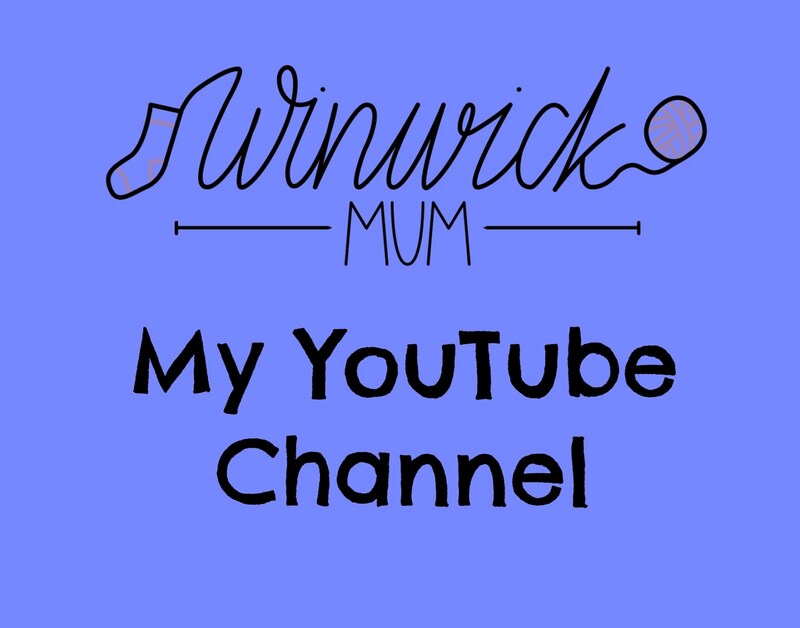 Feel free to ask questions, and of course there are the groups on Facebook and Ravelry too for help and support – Facebook is also a good place to show off pictures of your progress so don’t be shy! 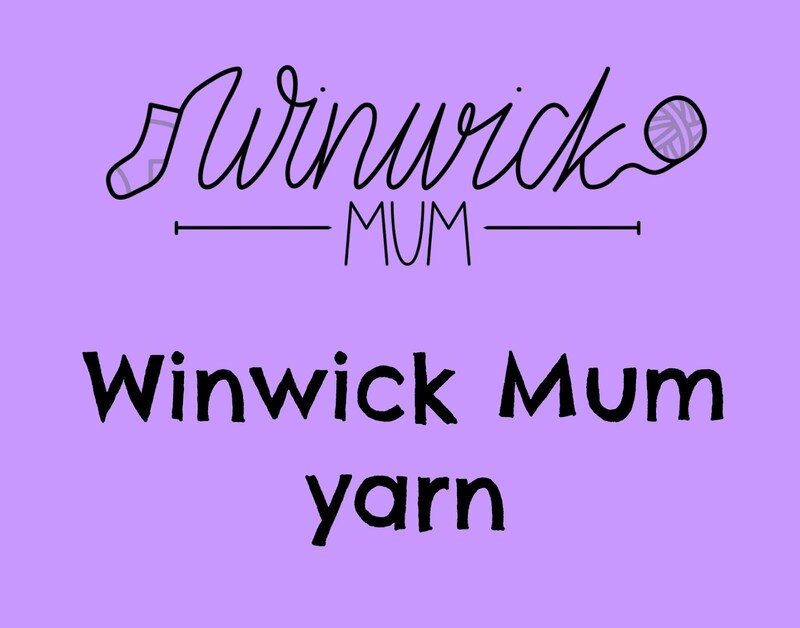 We also have knit n natter group on Facebook (Winwick Mum Sockalong Society) which you can find here to join in with the conversations. There's even a Flickr group so that we can share photos of our finished socks. 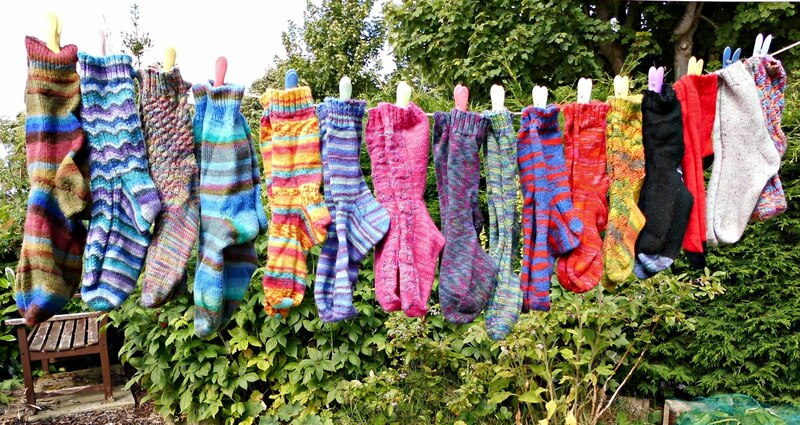 Yes, I know that this is just the first post and it's all about taking it at the pace to suit you - but I also know that there are a few people who can't resist knitting the rest of their socks straight away and I think it will be wonderful to see how many pairs of socks the Sockalong generates! The other thing that I would say that is REALLY IMPORTANT for beginners is don’t worry too much about any small mistakes. Mistakes are what help us learn and make our socks unique! If it’s a really big mistake you might need to unpick and re-do that part, but if you’ve got the right number of stitches and your sock is looking good, then “mistakes” like ladders and uneven stitches are the sorts of things that will often right themselves in the wash.
Next Sunday we’re going to work on the heel flap, the heel turn and the gusset. If you’re not up to that point by then, it’s absolutely fine as you’ll catch up, and if you’re steaming ahead then by all means put your first sock on a stitch holder and cast on for your second! 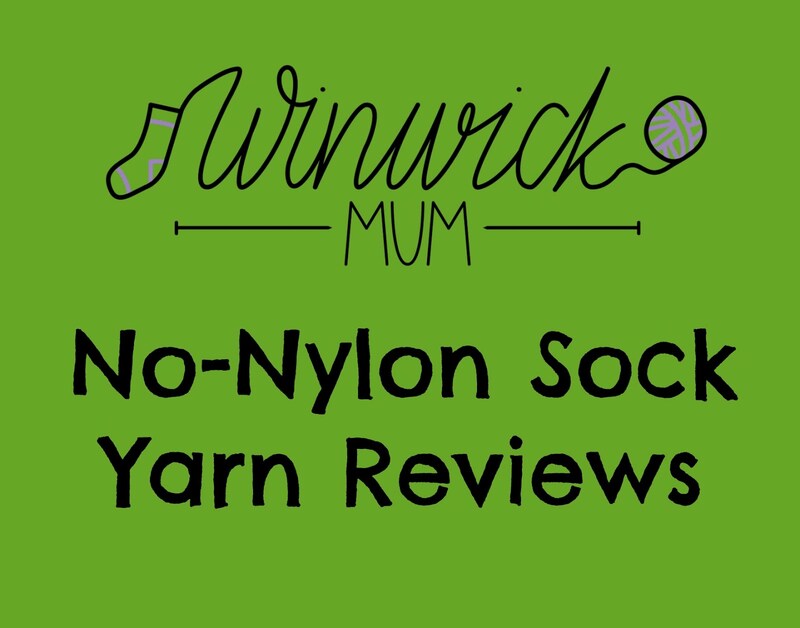 We’ll be talking about Second Sock Syndrome and ways to avoid it as we get closer to finishing our first sock, so if you’ve got any good methods then do share! 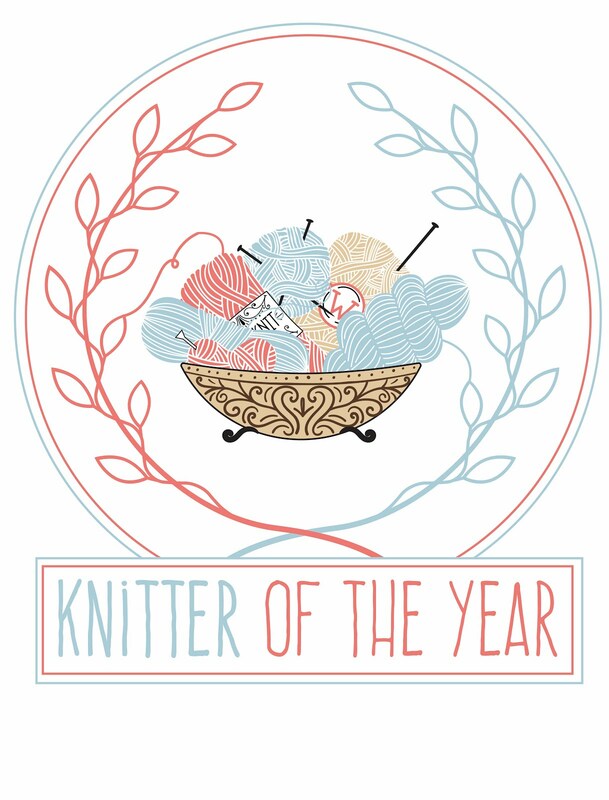 Happy knitting, everyone! So clear. Cannot wait to start tonight. I'm using dpns again but I'd like to have a go with a short circular needle, I shall have to buy one so that I can give it a go. 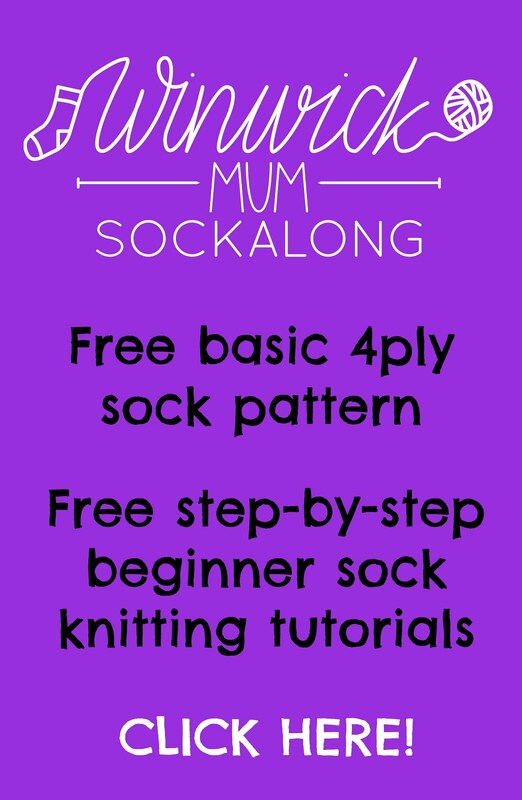 Not sure about magic loop, it's always looked a bit complicated but you make it sound easy so I might give that a go too, I suppose the benefit of this is that you get two socks done in one go. Yeay everyone! Go for it. Much respect for all those socking along, from a non-sock-maker. I just found your blog through a link at Through the Keyhole's blog. 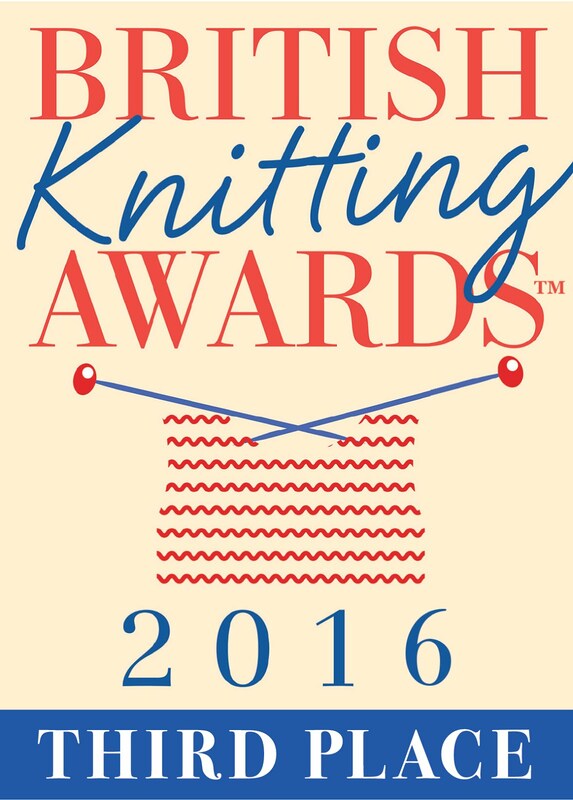 I am an avid sock knitter and have some in progress right now, so won't be joining your KAL, but I look forward to seeing how everyone does. It's so nice to have discovered you! Hi Christine, I am up and running on the rib! In the end I worked out that little daughter's foot size would need me to cast on 48 stitches so I decided it might be too small for a first attempt at sock knitting. So I'm making some for me instead! Thanks for taking the time to do this. Love the yarn you're using! And you have a wonderful blog. Thank you for your time! My question is.. when knitting in round I find it very difficult to knit from the front of the stitch. It takes me forever.... if I were to knit from behind the stitch, would the sock not come out right? Do you know? Thanks so much! Hello! Without seeing what it is that you're doing, it's quite difficult for me to answer the question. 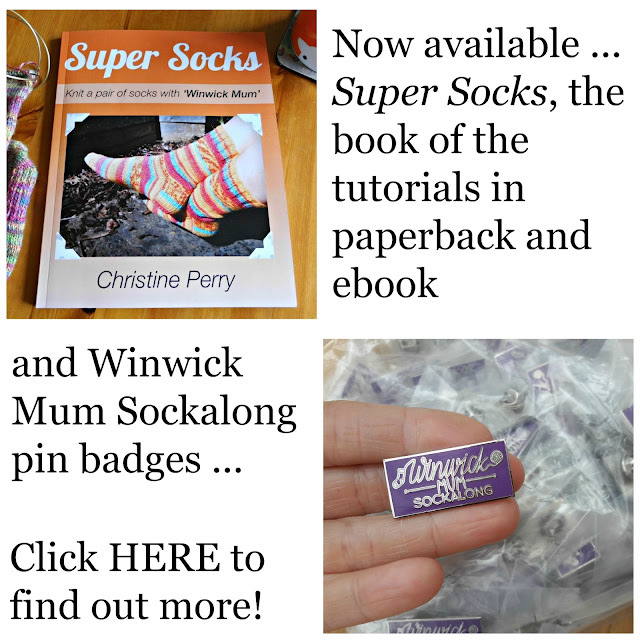 You create a purl stitch by putting the needle in from behind so although your sock would look different, there wouldn't be anything wrong in that; socks can be created in all sorts of different patterns.. If you're not very far down your sock then that might be why you're finding it difficult but as you get further down it should get easier. I'm not sure that I've really answered your question but I hope that helps! Am very excited to be halfway down the leg of my first ever sock! Just discovered the sock along, and am finding your instructions really clear and easy to follow. I've never used DPNs before either- congratulations on a super blog! glad I stumbled across your blog. going to try my luck at this. guess it will be a knit along; but alone. thanks for posting. Just started my first sock ever. Wondering how i go about matching stripes when i start my second sock. I've "really" started knitting 2 months ago and just love it (by "really" I mean I'm more of a seamstress-and-corchet-type of girl and I know some knitting basics)! I'm about to finish my first sock thanks to your Sock-a-long and I'm so pleaaaased with it (apart from some rookie mistakes, but hey, who will look into my boots?!?). 2nd sock will be awesome, I'm sure! Im trying my first steps with 5 dpns,and I stuck in the very begining. Can,t figure out how do you go to the round step. I'm using DPN's for the first time and I'm finding 3 easier than 4, but that might change as I get into the shaping. 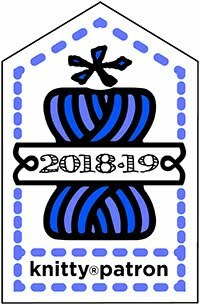 I'm still doing the cuff and counting the rows with a little app I put into my phone, much easier than paper and pen, lol. A question: usually I like to wear stockings which arrive just below the knee. Do you think it would be possible to modify this pattern that way? Hi Christine, i am new to this and excited my circular needle is arriving this Friday. after reading through the tutorials i am not very clear of how to join the rows and knit in rounds using the circular needles. Also wouldnt there be a split from the first three rows when we start the join from the fourth row. I hope you understand my issue. Thanks. It took me few days to respond and there is reason why. First I couldn't understand join the round, because my needles was on opposite sites of working yarn LOL. Of course once you explain that part I got my AHA moment....After making my 2 rows on stitches K P, still my work end up curled, twisted, and my working yarn was still all over the places, under my work , over- simply mess. I could not understand why ...LOL...So, I went searching youtube for videos that shows circular knitting ribbing, and then another AHA moment came in- of course I had to move my working yarn back and forth- well did not think so when I was trying to fight with 5 needles...Lmao....Anyway after 2 days of trying I gave up, and said to myself; This tutorial is not for me no matter how simple it is, since everything came all twisted ha ha ha...I took my sock loom and start knitting the sock, and of course love it, simple pulling the yarn, etc...Long story short, deep down in my heart I badly want it to knit the socks for years, and I can get off my mind to buy that small miracle circular needles. I searched in my city over here, and I call one of the stores and ask for Chiagoo 30 cm, - no luck. Searched online found them, but I want them today, so no luck there either.. This morning I call one of the yarn stores that going out of business and ask for circular needle 2.5 30 cm - you got the point....She said no I don't have Chiagoo, but I have addi turbo . AHA new moment, and I want to know is it curved, and is it 30 cm, and is it 2.5. All my question get answered yes . Hoooray, I was on my way to get that small magic circular needles to start making my socks. I'm so determined. Anyway I'm proudly knitting my first cuff on Addi Turbo 2.5 30 cm, and going around. Absolutely amazing. I'm sure that I will at some point go to my DPN without any issues and problems. I hope to finish the sock with your tutorial. I'm so lucky to found you, and I'm sure I will be in contact again. Thank you so much . Thank you so much Christine. You have demystified the sock! So easy to follow on short circulars...now to read your dpn instructions so I can try other patterns. Happened upon this post when searching for easy sock instructions and used it to knit my first pair- they turned out pretty well if I say so myself. :-) Thanks so much! I’d love to make a pair for my 8-year-old niece but unfortunately she doesn’t live nearby so I can’t have her try them on during the process as I did with myself. Any recommendations for child/tween sizing? Hello, Christine. I have really benefitted from your excellent instructions and tutorials. Thank-you! I have been using Techknitter's 3-in-1 tech join for hats and I now use it for top down socks. In her her instructions, she suggests knitting the first 3 rounds in plain knitting, which I do for hats, but for socks, I only knit one round in plain before beginning the K2, P2 ribbing (it gives the top a nicer look). I have also switched to a purl-wise longtail cast on. This technique means there is no "jog" to tidy up, the end is knitted into the top edge, and the stitches stay "sunnyside" up when starting the first round. You and she have helped me improve my self-taught knitting self many times over the years, so I thought I would share it. Thank-you again. 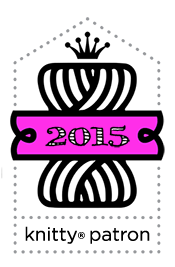 Monthly Musing - May 2015 - Have your say!